Click a product name below to enter one of our Galleries or read more about each series. The Master’s Series is for the wood enthusiast. 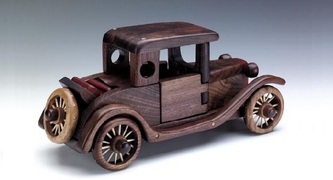 This series uses specialty woods which allow you to customize a car to your wood tastes. You will find many of the collector’s series in a variety of exotic hardwoods. Just like the Collector’s Series, the designs are based on a puzzle concept. The various parts of each toy can be taken apart, giving the toy yet another dimension of enjoyment. These are sure to become treasured family heirloom. 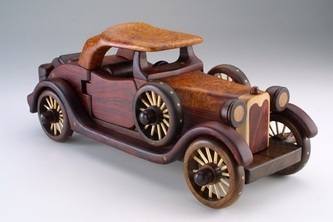 The Collector’s Series toys are original designs preserved forever in hardwood beauty. 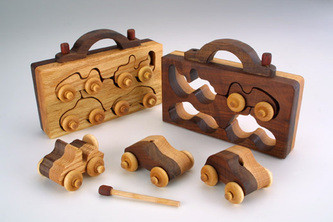 Wood for the different toy parts is carefully selected from rough lumber such as walnut, cherry, rosewood and maple. The woods and their rich grain patterns give each toy its own personal quality. Not two toys are exactly alike. Hours of painstaking care are given each toy as it progresses from initial design to precise fitting and shaping to hand sanding and finally to lustrous oiling and waxing. The Collector’s Series toys have a surprising feature which is exclusive to Baldwin toys, most of the designs are based on a puzzle concept. The various parts of each toy can be taken apart, giving the toy yet another dimension of enjoyment. These toys are intended as collectible pieces of artwork. The Heirloom Toys are the introductory line. Many of the designs also include the puzzle concept, however, they tend to be simpler versions of the collector’s series cars. The toys are made of a variety of beautiful hardwoods, contain no metal or plastic parts and are nicely finished to be safe for children. 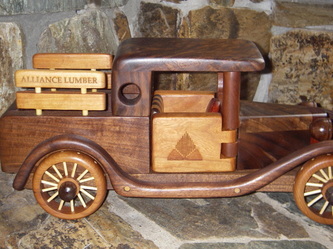 Our toys are timeless and durable. We can say this with confidence because all of our toys have been “road-tested” by our own children and by various child centers. Best of all, our toys need only a child’s imagination to bring them to life! If play is a child’s work then our toys make the ideal tools of the trade. They are sure to become your family’s special keepsakes. A wonderful collection of unique and timeless gifts. 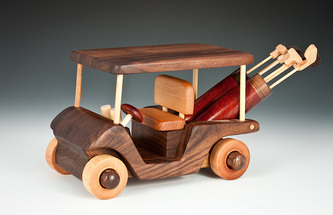 For the hobbiest the gallery includes items like kayaks, skis, golf bags, and surfboards. A wonderful collection of unique and timeless gifts for clients and co-workers. You will find a wide range of gift ideas; many which can be personalized with corporate logos or family names for that special touch.